Brandi Chastain's Hall Of Fame Plaque Looks Like Basically Anyone But Her : The Two-Way The bronze depiction of the U.S. soccer legend called to mind Jimmy Carter, Eleanor Roosevelt and Gary Busey. Chastain took it in stride: "It's not the most flattering, but it's nice." Brandi Chastain after scoring the game-winning goal in the penalty shootout in the 1999 World Cup Final. Well, it was supposed to be of her likeness. This is Chastain in 2017, at the Rose Bowl, where she famously scored the game-winning penalty kick at the 1999 World Cup Final. Brandi Chastain at the Rose Bowl in 2017. This is the plaque of Chastain, winner of two World Cups and two-time Olympic gold medalist. Chastain posed for pictures with the plaque, and almost managed to not visibly cringe. "It's not the most flattering, but it's nice," she said. The discrepancy between the athlete and the depiction was brought to national attention by San Francisco Chronicle sports columnist Ann Killion. 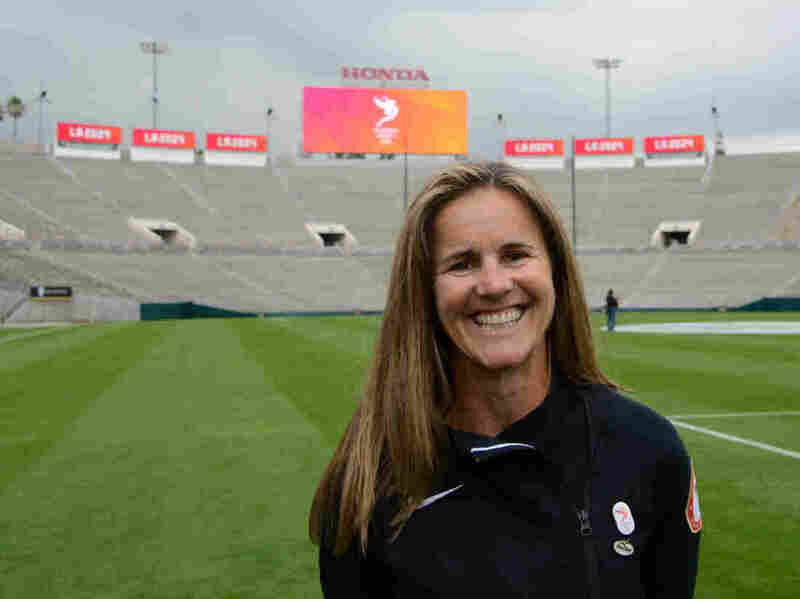 "Brandi Chastain is one of the most beautiful athletes I've ever covered," she tweeted. "How this became her plaque is a freaking embarrassment for BASHOF. Makes Cristiano's look perfect." Soccer Twitter leapt into action, diptyching like there was no tomorrow. Didn't the plaque look most like Eleanor Roosevelt? Or perhaps that toothy smile was more reminiscent of former NFL coach Rex Ryan. But something about the cheeks and brow really called to mind Biff, from Back to the Future. A very strong case was made for actor Gary Busey. And for peanut farmer and president Jimmy Carter. The outpouring worked its magic. On Tuesday afternoon, Chastain told Killion that the Hall of Fame plans to redo the plaque. They've asked "for a photo of my choosing, so I need to find one," Chastain said.